Did you ever wonder how much we are dependent on the natural world? How our lives are connected to nature? Often we think of things like wood or other raw materials, and we appreciate the farmer for providing us with food, even if it is at our local super market. But do you ever think that the water you drink, the air you breathe, the wonderful vistas that you see when you take hikes in the forest are all “goods” provided for you by nature? When we listen to birds and catch a fish we are receiving bounty from nature – goods and services. To state the obvious, without nature we simply could not live. The leadership of the EcoSystem Indicator Partnership (ESIP) has been wondering about this too. We have essentially completed the first phase of what we set out to do in 2006 – ESIP 1.0 has been accomplished. However, we have determined that developing factsheets and databases using traditional ecosystem indicators, while important and continuing, may not be as useful as they could be in addressing questions and concerns of those who depend upon, and manage, the Gulf of Maine’s (GOM’s) bounty. We are moving to develop indicators based on the goods and services provided to people by the GOM ecosystem. While there are many ways to think about ecosystem goods and services, ESIP will use concepts developed by EPA’s Final Ecosystem Goods and Services Project (Landers and Nahlik 2013). Final Ecosystem Goods and Services (FEGS) are those goods and services produced by the environment that are directly relevant to particular users of the environment, called beneficiaries. They are qualities, quantities, and/or, features of an ecosystem that people care about and understand – they do not need to be translated into common language. Traditional indicators (ESIP 1.0) are mainly understood and used by scientists, but are not as well understood by people using, enjoying or appreciating the environment. FEGS indicators or metrics are easily understood by the particular beneficiary (see example illustration below, FEGS are in blue outline, adapted from Ringold et al. (2010)). FEGS are the goods and services produced by the ecosystem before any substantial direct human activity. So in the example of a crabber, Crabs in the Water is an indicator of a FEGS; whereas Crabs in the Store is an indicator of a FGS (Final Goods and Services) which require humans to capture, clean, ship, and display. Over the next year ESIP will be developing a framework within which a pilot set of FEGS indicators (centered on climate change) will be developed. Once developed, data will be acquired, analyzed, and provided to managers through factsheets and databases to better inform decisions for particular beneficiaries. Donovan, S., C. Goldfuss, and J. Holdren. 2015. Memoranum for Executive Departments and Agencies: Incorporating Ecosystem Services into Federal Decision Making (October 7, 2015), 5. Washington DC: Executive Office of the President of the United States. Landers, D.H., and A.M. Nahlik. 2013. 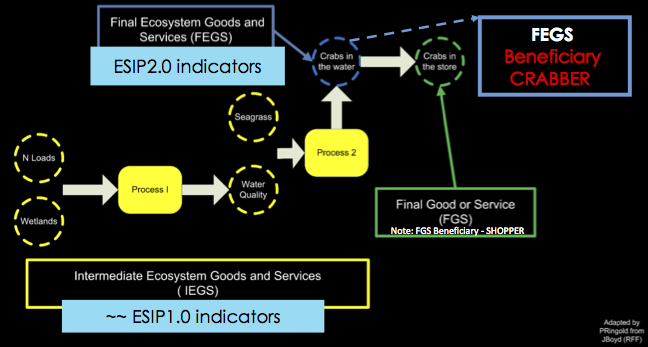 Final Ecosystem Goods and Services Classification System (FEGS-CS), 108. Washington, DC: U. S. Environmental Protection Agency, Office of Research and Development. Millennium Ecosystem Assessment. 2005. Ecosystems and Human Well-Being – Synthesis. Washington, DC: Island Press. Ringold, P.L., A.M. Nahlik, J. Boyd, and D. Bernard. 2010. Report from the Workshop on Indicators of Final Ecosystem Goods and Services for Wetlands and Estuaries, 78: U.S. Environmental Protection Agency, Office of Research and Development.